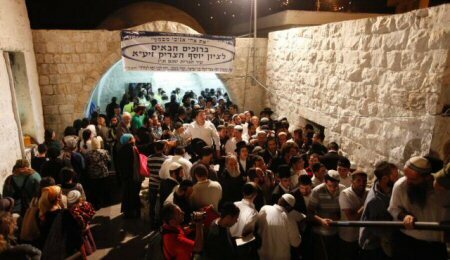 Hundreds of Israeli settlers stormed Joseph’s Tomb, on Thursday at dawn, in Nablus city, north of West Bank, guarded by Israeli forces under the pretext of performing Talmudic rituals and celebrating the Jewish Passover. Eyewitnesses said that more than ten military vehicles came from Beit Furik checkpoint and stormed the eastern region of the city just before midnight. They added, according to Al Ray, that these vehicles spread around the tomb of Joseph, and a reconnaissance plane was flying over the area. The witnesses also added that hundreds of young Palestinians confronted the soldiers by throwing stones and burning rubber tires in order to obstruct the progress of the Israeli military vehicles and the buses of the settlers. The confrontations centered on Amman Street and at the northern entrance of Balata refugee camp, where Israeli soldiers fired sound bombs and tear gas. The early hours of the morning witnessed the arrival of dozens of buses and vehicles carrying hundreds of settlers, as they held noisy celebrations inside the tomb. It is noteworthy that this intrusion is the first carried out by the settlers since five weeks ago, whereas they were previously storming the tomb twice a month.